Manchester United striker Wayne Rooney has accepted a Football Association charge for using offensive language, but not the automatic two-match ban. He is set to miss the league game against Fulham and the FA Cup semi-final against Manchester City. 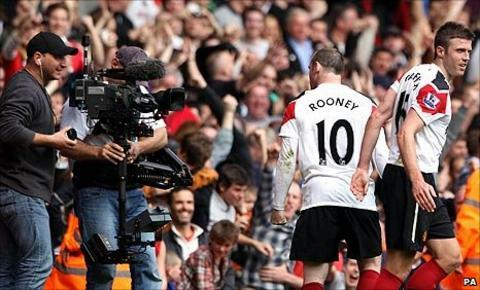 But Rooney has submitted a claim, which will be heard on Wednesday, that the suspension is "clearly excessive". The England star's submission will be heard by an FA disciplinary commission, although the verdict is not expected to be made public until Thursday, out of respect for United's preparations for Wednesday's Champions League clash at Chelsea. The former Everton striker could risk having his ban increased to three matches if his appeal is deemed to be frivolous, which would also rule him out of the league game at Newcastle United on 19 April. But Professional Footballers' Association deputy chief executive John Bramhall does not believe that scenario is likely. "If he is unsuccessful in his appeal the commission could look on the case as not being truly exceptional," said Bramhall. "But from my experience, the circumstances surrounding his case are unprecedented and therefore you would say it was truly exceptional." Manchester United currently top the Premier League by seven points, although second-placed Arsenal have a game in hand. Rooney will be available for Wednesday night's Champions League quarter-final with Chelsea if he recovers from a shin injury but manager Sir Alex Ferguson made it clear he did not want to discuss the matter at Tuesday's press conference. "I have nothing to say. I am not going to discuss it at all," he said. "We have submitted our case." Rooney quickly apologised for his actions after the victory over West Ham, a game in which he was influential in earning the three points for the Red Devils as he hit three goals in 14 minutes to help his side recover from 2-0 down.